When weeds don't obey the rules. Every Tuesday, everyone in the lab I work in, the DeLong Lab, meets with another lab, Brown University's Pollen Genetics Lab. We discuss current papers in our field, give occasional updates on how the research is going, what the next step will be, and things of that sort; a fairly traditional lab meeting agenda. The reason that the two labs meet as one group is that they are the only two labs at Brown that study Arabidopsis thaliana, a simple, diminutive weed that grows out from the cracks in the sidewalk. Like humans, or lab mice, the genome for Arabidopsis was mapped over the past decade or so and it suddenly became a model species in which the biochemical mechanisms responsible for everything we call life could be studied. Unfortunately, most research tries to aim closer at understanding the human condition, and the people who want to know exactly what makes this plant tick are few and far between. When I say unfortunate I mean it. While there are some wonderful, healthcare-related applications of human and even murine biochemistry, plant research is just as, if not more, important. Without a team of agricultural scientists slaving away at a university near you, the watermelon at the store would still have, God forbid, seeds. (Those seedless watermelons, by the way, came without even the cost or controversy of genetic modification -- they're analogous to mules: a cross between two organisms to create a sterile third.) And if you don't buy that, on a purely scientific level plants take the prize due to their malleability and ease of maintenance and reproduction. The mysteries of genetic inheritance were deciphered by Mendel using -- do you remember high school biology? -- that's right, pea plants. What's more, in March, a lab group studying none other than Arabidopsis found evidence that the seedlings they study don't necessarily inherit the traits that were passed on from the parents. It would be as if say, four-fingered Homer and Marge Simpson produced a five-fingered Maggie. On top of being published by the prestigious science journal Nature, the story received front page New York Times coverage and an NPR report. All in all it caused quite a stir. As responsible plant scientists, everyone in the two Arabidopsis labs agreed this was the surely the paper of the week to discuss. Dubbed the "hothead" paper, it was named for the phenotype of mutant plants, whose flowers have fused stamens, petals, and pistils. An email was sent out with an attachment of the New York Times and Nature articles. One of the post docs, Julian, made transparencies of the paper's important figures to help the discussion. Aubrey, a grad student, baked some zucchini bread. Arabidopsis had made it big. It was our job to understand why. At this point I should say that, in addition to the strong curiosity that most in the group possessed, there was quite a bit of skepticism as well. 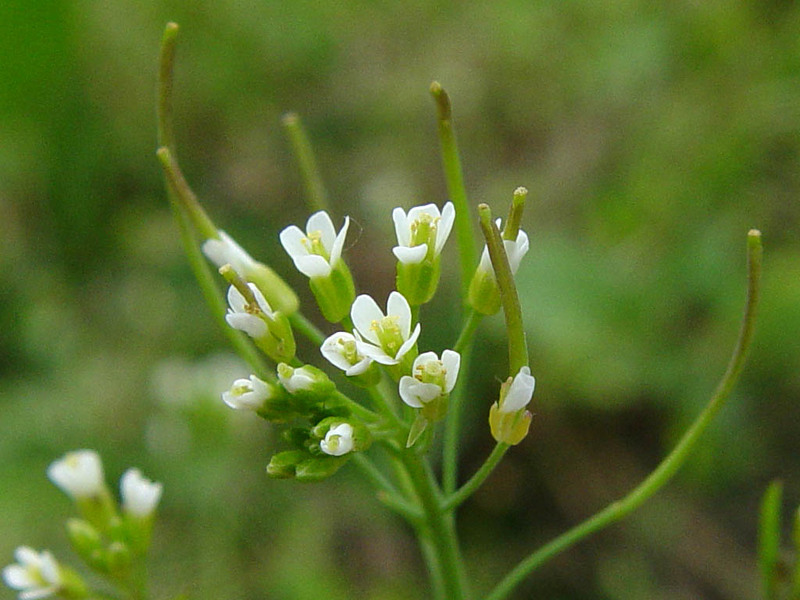 Titled "Genome-wide non-mendelian inheritance of extra-genomic information in Arabidopsis," the hothead paper essentially undercut the fundamental principles of heritability that Gregor Mendel proved in the 19th century with all those pea plants, the rationale that makes us assume that a baby will someday resemble her mother. For the faithful researchers whose experiments are grounded in mendelian inheritance, that sort of doubt feels pretty sore. Julian, arranging a transparency on the overhead, kicked off the discussion. "Well they don't have any data to back their theories about this extra, hidden genome." As usual, Julian cut to the chase. He gestured toward the data on the overhead. "There's no real answer to why this happens. Their explanation is just a shot in the dark." This is a typical, conservative, statement out of Julian, but he is exactly right. The authors have successfully recorded what amounts to an extraordinary anomaly of genetics, but they haven't provided a single data-supported theory as to why it happened. For all they know, the undergrad running the experiment on a day-to-day basis could have made a simple misinterpretation. Believe me. The data are, actually, quite typical for a molecular biology paper. There are a couple of tables, which show the frequencies of plants that are homozygous for the hothead mutation (that is, they have zero out of two possible normal hothead genes), and how these give rise to seeds that are heterozygous for the mutation (containing one of each mutant and normal hothead genes) They show that similar homozygous-to-heterozygous conversions also are occurring in other genes -- like the title says, the mechanism is "genome-wide." They also show a few mysterious images which contain a series of blurry white streaks in a black field. Amazingly, these abstract, seemingly meaningless pictures are the meat and potatoes of the data. They are results of a process called gel electrophoresis, and they prove that the mutant hothead gene was converted into its normal counterpart. In a nutshell, DNA was extracted from some plants, and a very specific part of the hothead gene was copied over and over in a process called a polymerase chain reaction. 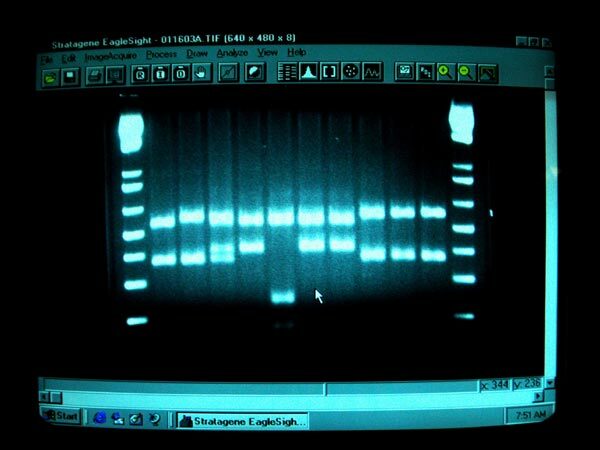 That DNA was then dragged through a piece of agarose gel (a not-so-distant relative of Jello), washed with a very, very carcinogenic substance called ethidium bromide that makes the DNA glow (yours too, if you spilled it), and exposed to UV light. Depending on the size of the DNA fragment, a blurry, glowing line appears in the gel. That line is the scientist's proof that the gene that he's studying is either there or not. Julian briefly walked everyone through this data while many around the table nodded, sighed and crossed their arms in contempt. Like the authors, nobody could really come up with anything to explain why the hothead plants were acting strangely. The subsequent debate over plausible and not-so-plausible explanations was, for me, an exercise in my ability to recall some technical genetic information that had been collecting dust in my brain since freshman year. The first simple explanation would be an increased rate of DNA mutations which could occasionally cause the normal gene to reappear from its mutant counterpart. This idea was quickly shot down by the authors. The hothead gene is repaired to exactly the same DNA sequence as the normal gene -- there aren't any other changes or mistakes that are evidence of a high rate of mutagenesis. Another possibility is that there is another copy of the hothead gene somewhere in the genome that is repairing the mutation through the action of a transposon, or piece of DNA that is able to be excised from and re-inserted into chromosomes. This possibility is eliminated by another picture, this one of blurry black lines, which, if you really buy this DNA, gel and electricity scenario, shows that there is truly only one copy of the hothead gene in the entire genome. That brings us around to a third possibility -- the one that the authors propose -- that there is a "genome wide sequence cache" or essentially a second, hidden genome that isn't detected through the shown experiments because it is made of RNA, not DNA. The presentation of this idea caused a bit of a stir among the group. Aubrey, who up until this point had been crocheting quietly, started cackling to herself. Other people felt that this was a grave issue, or it seemed so, what with all the furrowed brows, solemnly shaking heads,and even more tightly crossed arms. There was reason to treat this matter gravely, I soon learned. It had to do with the high publicity that this article received combined with the fact that the findings are still poorly understood. Nature magazine, one of the most prestigious and purely scientific journals today, gave this line of research some validity by publishing the article. The New York Times, NPR, and other news sources that picked up on the story broadcasted the information to the general public, as they should. The problem, then, is that the news wasn't taken, or told to be taken, with a grain of salt. The authors' baseless explanation about this complete, hidden copy of the plant's genome was merely marked with initial approval, before any research was conducted to support it with fact. It's tantamount to, say, telling folks that Iraq has weapons of mass destruction because a few pictures of some missile-shaped tubes were taken by the Pentagon. Jumping to conclusions based on a small set of interpretable information is irresponsible, in science or otherwise. So while the hothead research has made the headlines, it will be a while before it becomes a tale worthy of middle school science textbooks and lessons about another brilliant but socially outcast scientist. Over the next several years, as the hothead lab will dig deeper, more facts will come to light. Is there a second genome present in every cell, which, hidden among the sea of proteins and nucleotides already present in cells, has evaded molecular biologists for years? Two things are certain. It won't be too hard to prove, if it exists, given the research tools available, but it will make the story of inheritance into something far more complicated than we believe now. Just think -- if this extra genome's repair function could be harnessed, scientists might be able to figure out how to fix any number of chronic, genetics-based health problems, from sickle cell anemia to type I diabetes. Okay, so that's a little far-fetched. But it's safe to say that if the laws of genetics are rewritten in a textbook due to the hothead research, a full-scale picture of Arabidopsis will be on the cover, and it will hopefully be in color. Meanwhile, Arabidopsis, in the majesty of its simplicity, will continue providing answers for molecular biology labs, at Brown University and elsewhere.